CD2 Learning is the top winner in the 2014 People's Choice Stevie® Awards for Favorite New Products, a feature of The American Business Awards, the U.S.A.’s top business awards program, which are now in their 12th year. The nationwide public vote was conducted this summer, with the highest number of votes deciding the winners in 42 product categories. More than 57,000 votes were cast. CD2 Learning, the Overland Park, KS –based developer of a cloud-based learning architecture, is the winner of People’s Choice Stevie Awards in four categories. 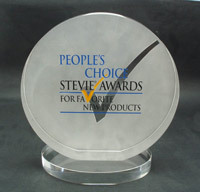 NetScout Systems, Inc., the Westford, MA –based provider of integrated computer network performance management products, won People’s Choice Stevie Awards in three categories. Winners of two People’s Choice Stevie Awards include CardioVet, Dell Software, MicroStrategy, Inc., Other World Computing, and Telerik. The crystal People’s Choice Stevie Awards will be presented to winners at The American Business Awards’ new product and tech awards banquet on Friday, September 12 at the Palace Hotel in San Francisco. Tickets for the event are now on sale. There, the winners of peer-adjudicated Gold, Silver and Bronze Stevie Awards will also be announced and presented their awards. More than 250 nominees and their guests are expected to attend. All new products and services recognized as Finalists in the new product awards categories of this year’s American Business Awards were eligible to be included in voting for the people’s choice awards. Stevie Awards are conferred in six programs: The American Business Awards, The International Business Awards, the Asia-Pacific Stevie Awards, the German Stevie Awards, the Stevie Awards for Women in Business, and the Stevie Awards for Sales & Customer Service. Honoring organizations of all types and sizes and the people behind them, the Stevies recognize outstanding performances in the workplace worldwide. Learn more about the Stevie Awards at http://www.StevieAwards.com and on Facebook, LinkedIn, Twitter, and YouTube.